Capt. 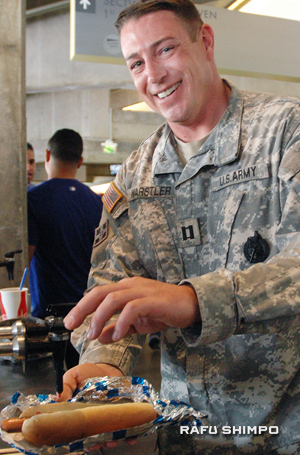 Jeff Warstler, commander of the U.S. Army’s San Fernando Valley Recruiting Company, gladly dresses up the first Dodger Dog of the season. DODGER STADIUM.–One fan coming through the turnstiles for Opening Day Tuesday at Dodger Stadium uttered the words that would be music to the team and its management. 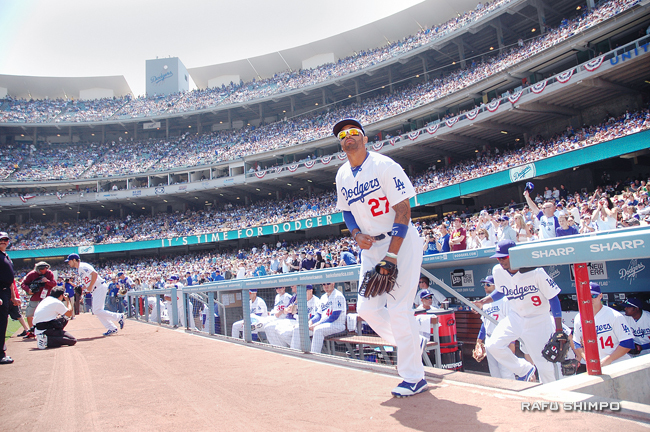 After a 2011 season of off-the-field turmoil that began with the savage beating of a San Francisco Giants fan last opening day, the Dodgers are all too happy to indulge in the spring baseball cliche and begin anew. Former Dodger Maury Wills, who took the field when the boys in blue played their very first game at the new Dodger Stadium exactly 50 years ago, used one word to illustrate the new season and tip his cap to the new ownership of the club. “We could say there’s some magic in the air,” he quipped, alluding to former Lakers star Magic Johnson, who is part of the group that is in the process of purchasing the Dodgers from embattled owner Frank McCourt. Neither Johnson nor McCourt were seen in the seats during the festivities. While the Dodgers have no Nikkei players on their roster to begin 2012, Kohrogi praised the progress of several prospects currently in their farm system, including pitcher Kazuya Takano and catcher Fumimasa Ishibashi. In ceremonies held prior to Tuesday’s home opener against the Pittsburgh Pirates, the Dodgers introduced several members of the team that played that first game in the new ballpark on April 10, 1962. The former teammates included Wills, Tommy Davis and Ron Perranoski. From left, Bruce Johnson, Mike Love and Brian Wilson of the Beach Boys sing the national anthem. 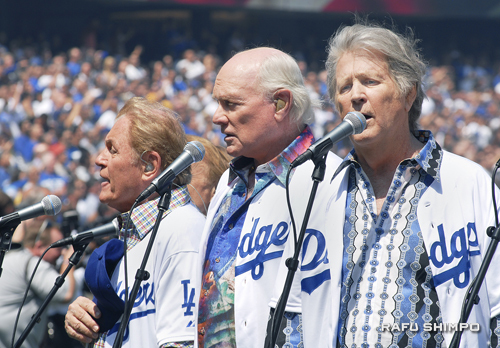 The legendary rock group is celebrating 50 years of music, as Dodger Stadium marks its 50th. Also marking a half-century this year are the Beach Boys, who have reunited for a tour and new album. The legendary pop icons of the 1960s performed their hit “Surfer Girl” before the game and also sang the national anthem. The day was missing a key component for the fans, however. Hall of Fame broadcaster Vin Scully, who is entering his 63rd year with the Dodgers, was not in attendance, due to a severe cold. It is only the second opening day that Scully, 84, has missed for the Dodgers, the last absence coming in 1977. As for the game, outfielder Andre Ethier slugged a home run with two outs in the eighth inning to break a 1-1 tie, and the Dodgers went on to a 2-1 victory to make their stadium’s 50th birthday cake a little sweeter. Among the dignitaries on hand was former team owner Peter O’Malley, who was proudly letting his pastel-colored necktie adorned with ducks express his feelings of the day. Free event the baseball fan, talking Dodgers @ The Times, 4/19 at noon. Intimate discussion with columnist Bill Plaschke and baseball writer Bill Shaikin, up close and personal. Click on for free rsvp, some seats left.